(40 PACK) Xelogen 5W (watt) 24V (volt) xenon festoon base bulbs/lamps. Typically used for cove lighting. Can be used to replace incandescent versions such as auto bulbs. Xenon bulbs give a bright white light like halogen bulbs without the UV (ultraviolet light), which makes these the ideal bulbs for highlighting sensitive fabric or artwork. 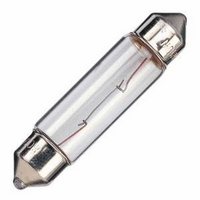 Xenon bulbs are more tolerant when dealing with unstable voltages resulting in longer life. Filled with low-pressure xenon gas, does not require shielding. Average bulb life 15,000 hours, MOL (length) 1.732" (44mm), clear quartz lense, 50 lumens, color temperature 2800K, fully dimmable to 0%, no ultraviolet/no infrared - safe for artwork, 100% mercury free, environmentally friendly.